Nine out of 10 Americans consume more than 2,300 milligrams of sodium, the recommended daily threshold, according to the Centers for Disease Control and Prevention. 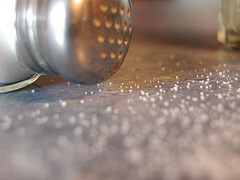 Too much sodium in your daily diet can cause hypertension and lead to other diseases of the kidney, liver, and heart. We need some salt and many of us really like salty tastes, but researchers have found that people’s salt preferences respond to the amount of salt they eat — over time, you get used to a given level of salt consumption, and you can change your preferences just by eating less for a few weeks. But the problem isn’t just laying off the salt shaker. Most Americans over-consume salt because of restaurant and processed foods. The best way to cut sodium down to recommended levels is to pay attention to what you’re eating by reading labels and being conscious of your salt intake. Many manufacturers use sodium as a preservative for a wide range of products, from bread to lunch meats, as well as for flavor. Sometimes salt is used to disguise the lack of flavor in highly processed foods — without the fresh tastes of fruits and vegetables, some processed foods may have no real tastes except salt. Prepared meals in the freezer section are some of the worst culprits, sometimes containing a whole day’s recommended threshold in one serving. Restaurants are even more difficult, since there are no labels showing the salt content of what you’ve ordered. Keep a watch on your sodium by choosing fresh, natural foods more than processed foods. We know this is hard when you work late or have lots of after-school activities with your family. One way to make it easier is to freeze your own meals. Home made freezer meals last around 4 months after being frozen so you can always make a bunch of extra meals one lazy Saturday for months in advance if you plan accordingly. In restaurants you can opt for lower-sodium by choosing made to order options instead of fast-food. Choosing things like baked and roasted lean meats and asking for lower sodium options will help you stay on track for your sodium levels. You can also plan ahead and avoid salt the rest of the day to make up for a meal out. Snacks are also a huge source of excessive salt. Potato chips, fries, and processed snacks are usually covered in salt or use other types of sodium to preserve snacks and heighten taste. Instead, opt for fresh fruits and vegetables or super low-sodium snacks like our Fruti frozen fruit bars. With under 10mg for most bars, with all sodium from natural sources, Fruti bars are a healthy low-sodium option. Canadians are not any better, we consume just as much salt as Americans, in fact I didn’t even know that sodium was in bread. Really interesting article! Thanks for the info!